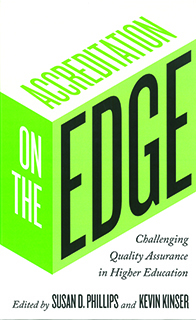 In this recent publication from John Hopkins University Press, authors Susan D. Phillips and Kevin Kinser brought "together the expertise of different stakeholders to illustrate the complexities of the accreditation system and to map the critical issues that must be navigated going forward." ACTA's past president Anne D. Neal and current vice president of trustee & government affairs Armand Alacbay contributed a chapter entitled, Fixing a Broken Accreditation System: How to Bring quality Assurance into the Twenty-First Century. ACTA hosted a panel discussion on Capitol Hill, sponsored by the House Committee on Education and the Workforce, aimed at exploring issues addressed in the book. You can purchase the book on amazon.com.